This year I meant business. And pleasure. I found my dream kayak. 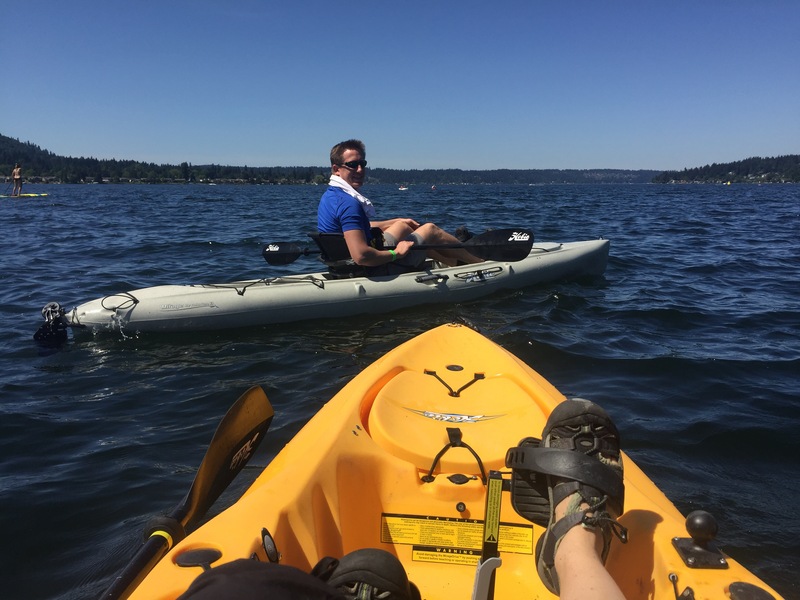 I went last year and loved going but didn’t really know what I was looking for in a kayak. Two complaints: compared to last year the classes weren’t as interesting and Pygmy kayaks wasn’t there (one of the main kayaks I wanted to try again). Improvements: there were a lot more kids activities (didn’t help us at all but it was good to see). This year we also came prepared with a Discovery Pass for parking. 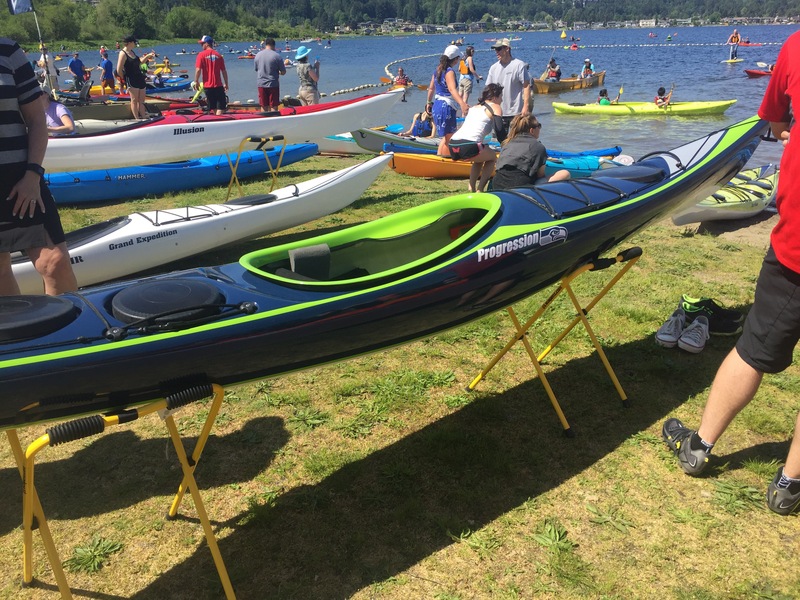 Packing your kayak was a good reminder to be more organized when packing (and to pack less!). Skeg vs rudder: The take-away for me was that a skeg does sound pretty good as I’m looking for a sea kayak but I’m not too worried about my current rudder. The diagram is showing how when a wave goes by the rudder can be out of the water, not allowing you to steer in rougher conditions. Also, if the boat is made with a rudder it may not be built to function well without it in comparison to most boats made with a skeg, so if the equipment fails (which can happen on either) you’ll be in more trouble with a rudder. Another point he made a few times is that if you’re heavily relying on the rudder for turning that you may find yourself in conditions that are too advanced for you so the skeg will help remind you to go to shore. There were so many people it was great! 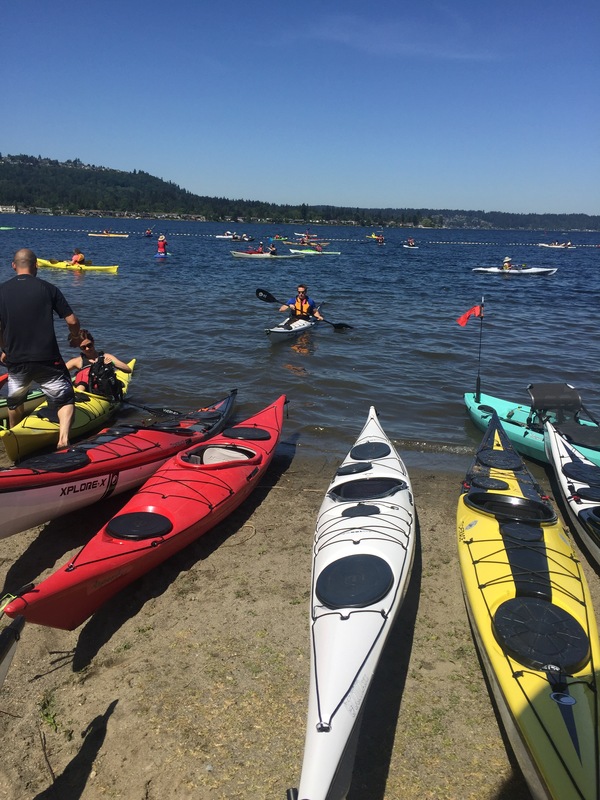 Lots of tents to check out gear, find out more about the water trails, life jackets, etc., and of course lots of kayaks to try out ($7 all day kayaking- free for the rest but then why go?). 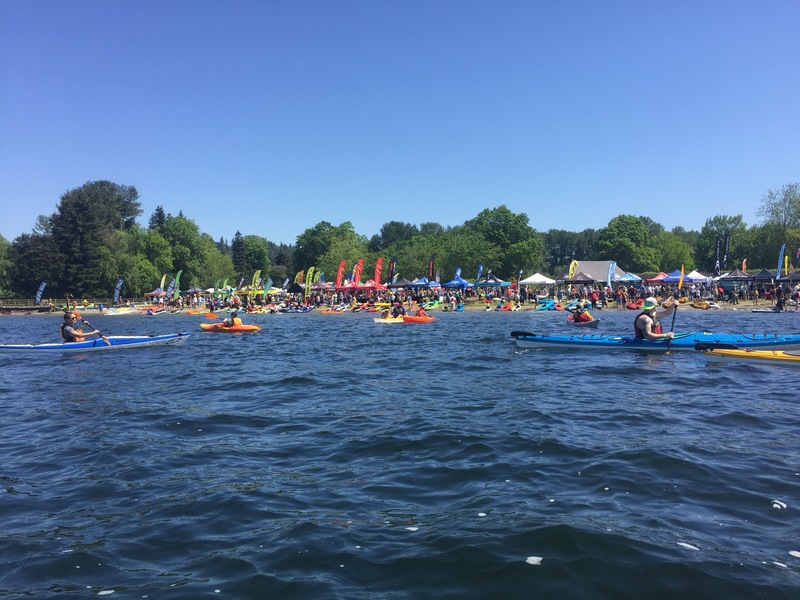 Lots of people were out, including a few show-off white water kayakers dipping their noses in and flipping over and back again 🙂 One sea kayaker also put on a show rolling his kayak over and over again. No one could resist getting a little wet in the 86 degree weather! 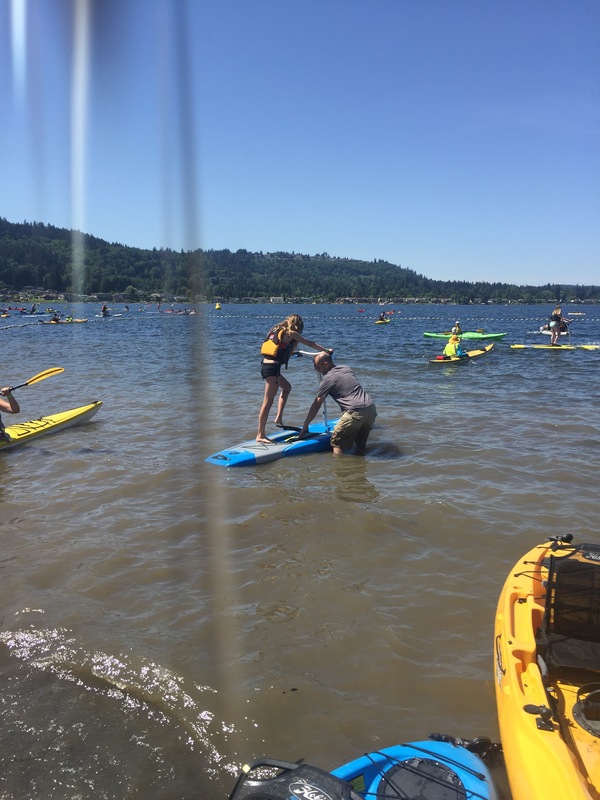 You could also try stand up paddleboards (normal, elliptical style like above, motorized, and who knows what else). I wanted to try the elliptical type SUP (pictured above) but so did everyone else and I didn’t feel like standing on land waiting in line. It was really busy with a lot of people to nudge into (I didn’t personally but I witnessed a few collisions and near misses like the one above). 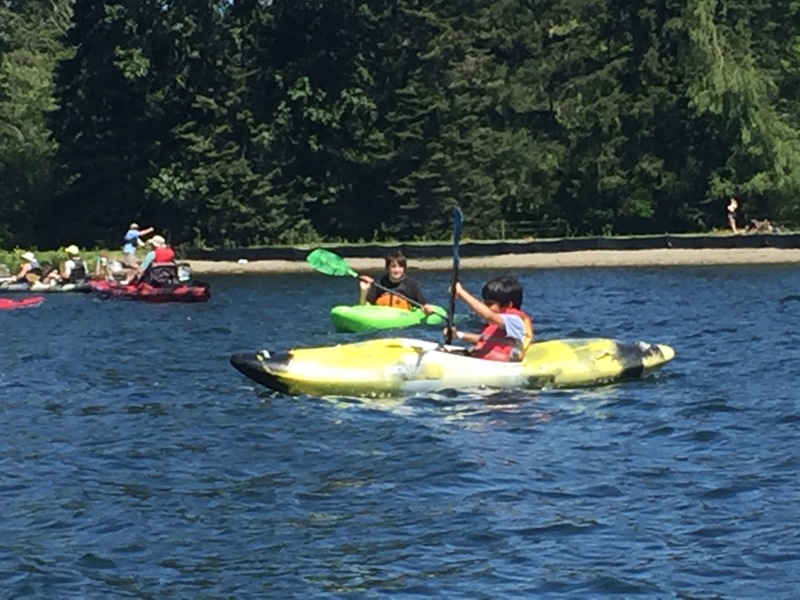 The most fun kayak to try out for us was this peddling one. We could go really fast (Alex was in the longer version and could go even faster!). 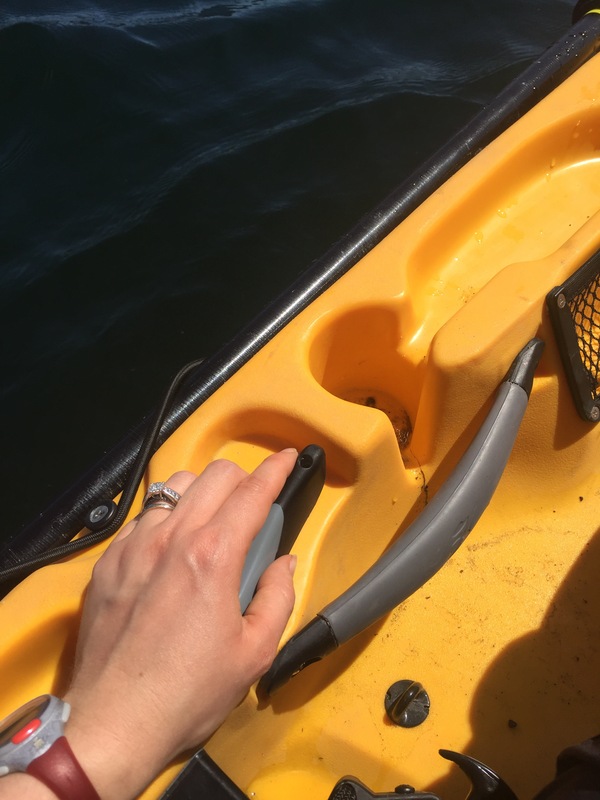 You don’t need a paddle except to go backwards (if there’s another way I didn’t figure it out), steering with a little handle (pictured below). 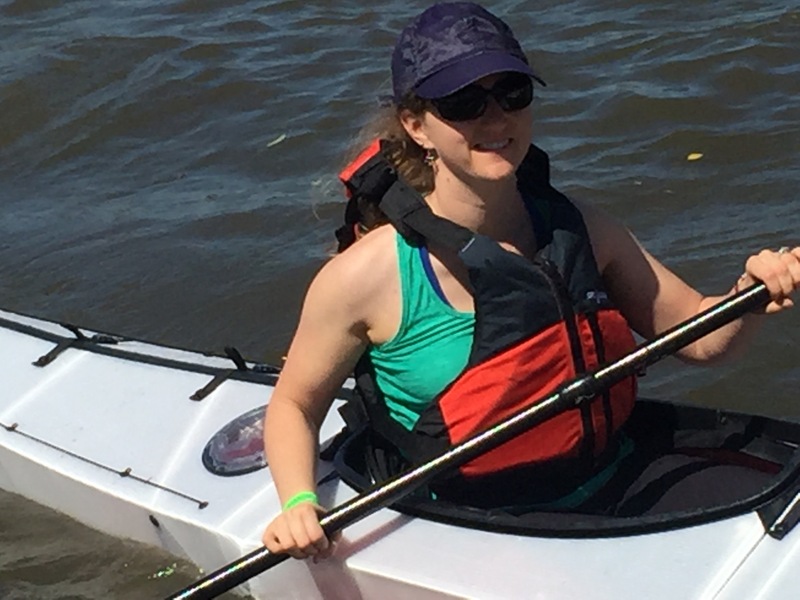 It was fun to zip around paddle free but it got tiring quickly and I wouldn’t want that to be our main kayak. At first I just wanted to be on the water. Then I remembered why we were there. 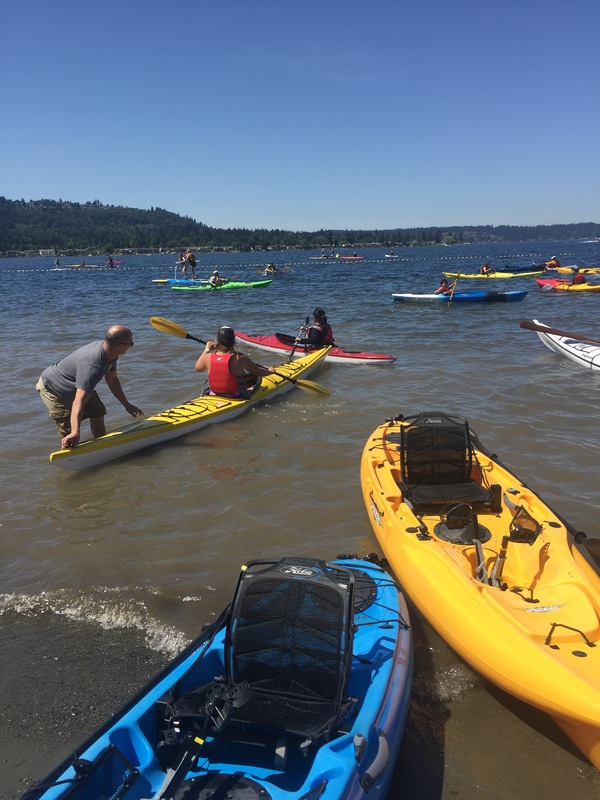 To find sea kayaks! 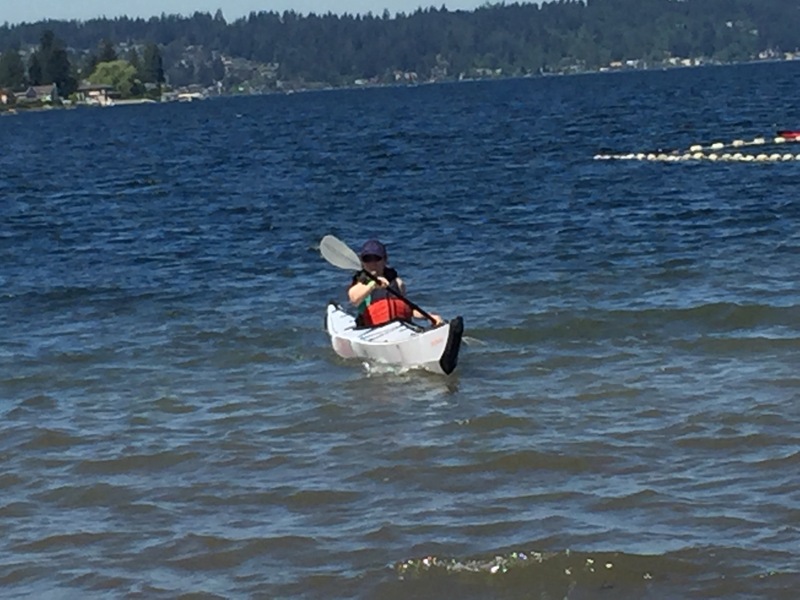 We tried the new foldable Oru kayak with a day hatch (the rest of the boat is additional storage). I liked it better than the inflatables I tried out last year but didn’t care for all the flexing on the underside and definitely didn’t like the footrests (I ended up just putting my legs flat on the ground because I couldn’t get them to cooperate). I didn’t get to try this one but had to post it anyway, since it’s Seahawks. 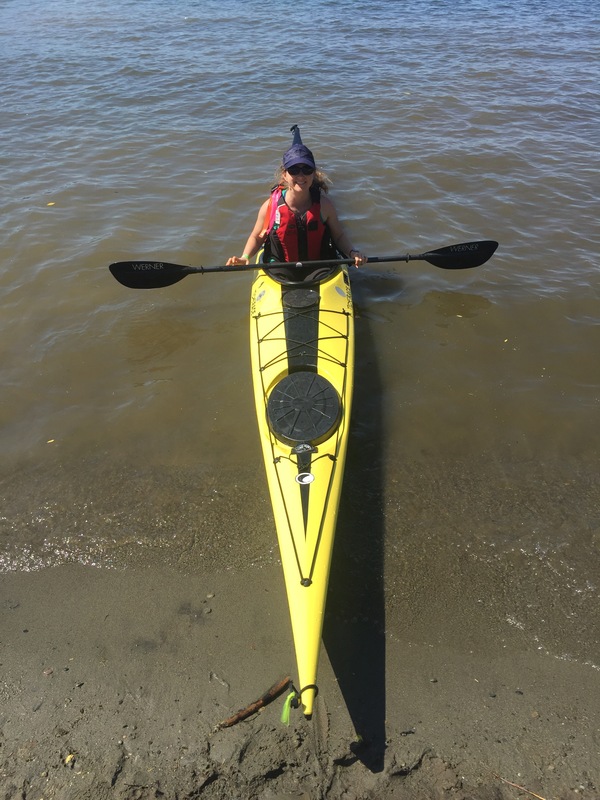 Alex tried a lot of kayaks and liked the Xplore-L (pictured below) but wants to keep looking. 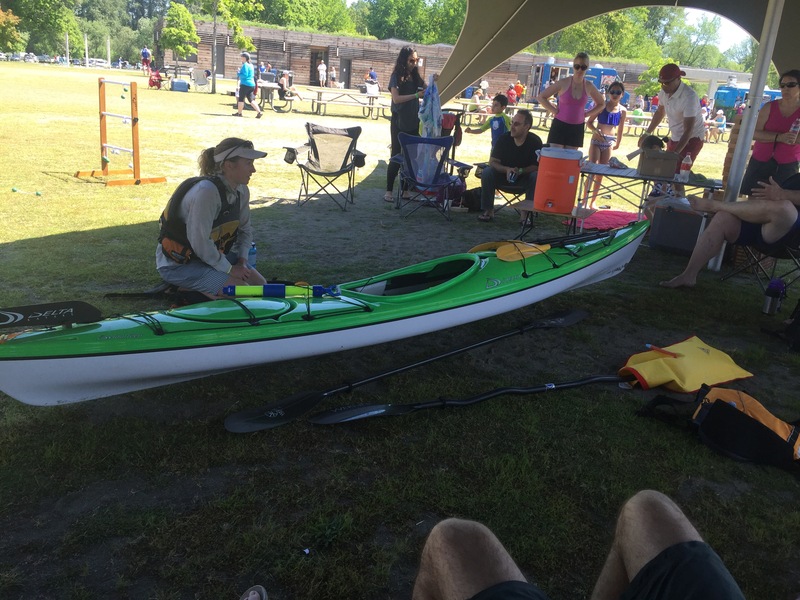 I tried a few more but after several times back to the Kayak Academy tent I finally got my turn on the TideRace Xplore M. This hornet was worth the wait. I could go really fast but still turn fairly easily (with the skeg up) and could feel the secondary stability when edging. The cockpit fit perfectly to me (the Xplore S is REALLY small for my soccer thighs). Everything felt fantastic. 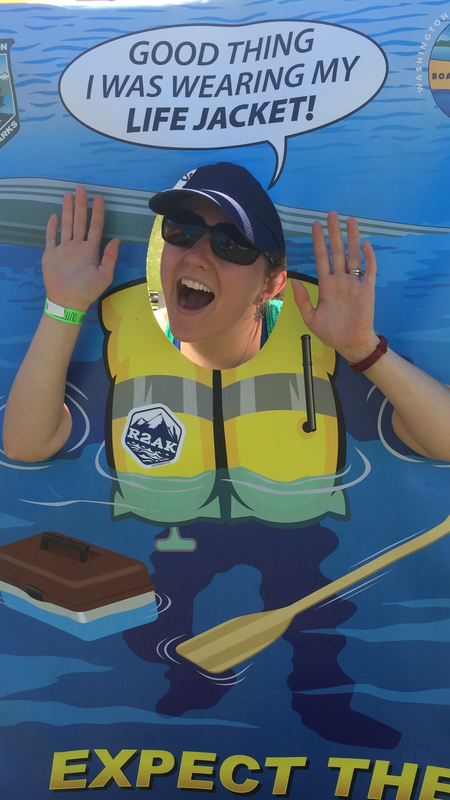 Despite being 4 grand the boat was sold out and won’t be available until August through Kayak Academy! Also, I really like the hornet type colors and the newer models coming in don’t have this color, but that was just icing on the cake. I hope to still find a way to make her mine; stay tuned.